West Virginia University has announced that it has received a $500,000 grant from the BB&T Charitable Fund for the College of Business and Economics. The funds will be used for the Center for Financial Literacy and Education and the new business school complex to be built on Morgantown’s waterfront. Pictured at left is Bobby Blakley, BB&T Regional President, West Virginia Region, with Javier Reyes, Milan Puskar Dean of WVU’s business school. A $500,000 grant from the BB&T Charitable Fund will be used in the Center for Financial Literacy and Education at West Virginia University’s College of Business and Economics and for the new business school complex to be built on Morgantown’s waterfront. Bobby Blakley, BB&T Regional President, West Virginia Region, said the support directly reflects BB&T’s mission, and that these resources will be used to their fullest extent by the business school. Naomi Boyd, the business school’s Fred T. Tattersall Chair in Finance, associate professor of finance and the founding director of the CFLE, said the BB&T grant furthers the Center’s mission to offer high level classroom and experiential learning opportunities to students. These opportunities, she said, will provide students with career tracks in finance from Main Street to Wall Street. Boyd was quick to point to the outreach component of the CFLE, which includes seminars on financial planning and retirement planning, a Smart Money Series, and a longstanding educational program for primary and secondary school teachers: Finance University. A portion of the grant will also be used to build the new business school complex on Morgantown’s waterfront on the site of Stansbury Hall. The new complex, Reyes said, will capture the progress and innovation that have transformed the West Virginia University campus in recent years. Prior to this grant, the financial institution’s support created the BB&T Distinguished Chair of Free Market Thought in Economics. A $500,000 grant from the BB&T Charitable Fund will go to West Virginia University’s College of Business and Economics for its Center for Financial Literacy and Education and the new business school complex. 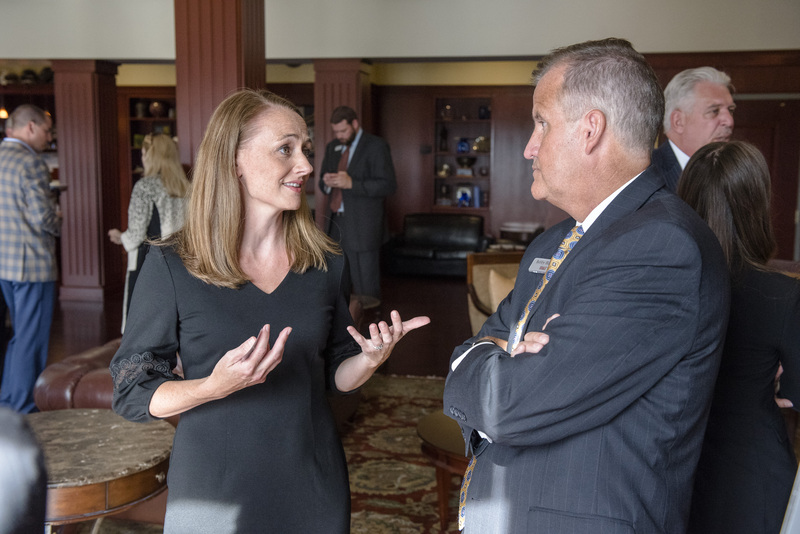 Pictured at right is Bobby Blakley, BB&T Regional President, West Virginia Region, talking over center activities with Naomi Boyd, the business school’s Fred T. Tattersall Chair in Finance, associate professor of finance and the founding director of the center.